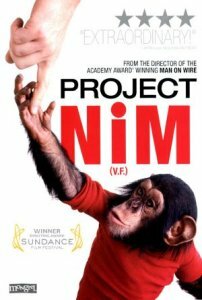 Worldbridger Film Series "Project Nim"
Dec 06: Project Nim (2011) Directed by James Marsh. 93 min. UK, USA. In English. Rated PG-13. From the director of the Oscar-winning Man on Wire comes another incredible but true documentary, the reverse-Tarzan story of a chimpanzee named Nim Chimsky, brought up on the Upper West Side of New York by behavioural scientists studying language. Both Nim and the many people who raised him are the subjects of the film, as is the controversial experiment of which he was a part. Weaving a tale both rich and strange, the film lightly navigates the moral complexities and ethical thorns scattered throughout.